The latest Indie release by Colbie Caillat - The Malibu Sessions, is a tour-de-force and a must have for fans of Colbie or fans of exceptional songwriting and musicianship. The release is a journey through love found, lost, wanting, and living for the now, captured through compelling lyrics and captivating melodies. Colbie Caillat - The Malibu Sessions was produced by John Shanks and this marks Colbie's first release on her Indie PlummyLou Records label. The Malibu Sessions is the sixth release from Colbie in a nine-year period. The release contains eleven new tracks which Colbie co-wrote with long time co-writer Jason Reeves, as well as Mikal Bleu, Kara Dioguardi, Danielle Leverett Reeves, Toby Gad, John Shanks, and Rune Westberg. I have a special appreciation for musicians when they move to an Indie label as they are taking a big step as they move away from their "comfort" zone associated with a commercial record label. The Malibu Sessions is not just 11 tracks, as there is a lot more behind the scenes when creating a release on an Indie label, as this is "your" release, "your" money, and "your" future. Besides the hours and hours of writing and scoring the tracks, there is mixing, final track selection and then arranging the order of the tracks on the release. 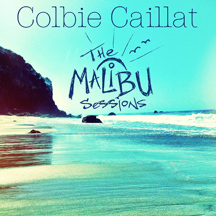 The Malibu Sessions succeeds on all points and is destined to become one of Colbie's top releases. The team behind the scenes and the musicians poured their hearts and souls into The Malibu Sessions. I had the opportunity to learn firsthand on how The Malibu Sessions came about when I heard Colbie Caillat live at The Ridgefield Playhouse, Connecticut (read Colbie Caillat - The Ridgefield Playhouse, CT, USA in the Performance section of Luxury Experience). A little history about The Malibu Sessions, the band wrote over 60 songs during a break at a beach house in Malibu over 5-years ago, and as Colbie commented, it was difficult to select the 11 tracks for this release, but just think about all the great music for the fans to look forward to in the future. The release opens with the rhythmic sounds of waves crashing against the shore and segues into Gypsy Heart, which starts with a guitar solo and beautiful harmonies that lay the foundation for Colbie's vocals as she sings" ...I can't wait to get back on the road...as long it is taking me to you. I can't wait to get back on the road.... I am a Gypsy Heart." Goldmine leads with the haunting whistling of John Shanks and a catchy Caribbean beat that will have you rocking back and forth whistling with John throughout the track as Colbie sings, "Fly me back to the moon where you took me the first time when you kissed me, ... when you light this fire...our love is a Goldmine." The track Cruisin' was created when the band was taking a break on the beach and a six-year-old boy ran by the group naked and carefree; you never know what will get the creative writing juices flowing. This is a happy-go-lucky track with lyrics that you can relate to and seem to draw from a past when we had no worries, "What if we were six again... life was like a vacation, building castles in the sand, cruisin' around naked...we be cruisin', we got nowhere to go...," oh if we could turn back the clock, well you can when you listen to this track. Picking up the tempo with the track Like Tomorrow Never Comes and Colbie's velvet vocals sing, "...curl up inside your arms...tomorrow never comes, we stay forever young...", a thought we have when we are in love with someone special. Colbie shows off her lyrical pacing with the track Only You and she rides the fast-paced tempo, which will get your fingers snapping and tapping to keep up with her. Colbie has a good thing going on with the track Good Thing, a solid baseline carries her vocals and drives this song along with great harmonies. Other tracks include Runnin, a country based theme with heartfelt lyrics that will make you feel and reflect, Never Go Away, a poignant track of opening your heart and giving yourself to someone else, Don't Wanna Love You, emotionally driven lyrics that draw from the feeling of breaking up with someone you care about, In Love Again, moves the listener from heartbreak to the feeling of love found, "..want to fall in love again with you...," the release closes with the track Now, "...you have to live in the now as you cannot go back to yesterday..," we have to deal with where we are and how we got there, and we have to live in the now. The release closes as it opened with the rhythmic sounds of the waves crashing against the beach. The Malibu Sessions will take you on a journey through your first love, being carefree, wondering how you got where you are, wanting something that you cannot have, but in the end, you live for now while listening to the relaxing sound of the waves crashing. Websites where you can procure Colbie Caillat - The Malibu Sessions are Amazon.com, BestBuy.com, Colbie Caillat, and iTunes.